My next YA book, Conjured, is now available for review on NetGalley! If you're a book blogger, librarian, educator, bookseller, reviewer, or publishing professional, you can request the eGalley here. And whether or not you're any of the above, if you'd like a taste of Conjured right now, please feel free to hop over to my website and read the first chapter. I am so, so, so excited about this book! It's the creepiest one I've ever written, and I had a blast working on it (though I'll never view carnivals the same way again). I can't wait to share it with you! 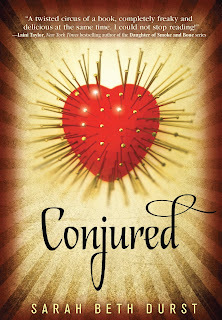 CONJURED will be coming out on September 3rd from Bloomsbury/Walker. VESSEL Won the Mythopoeic Award! I have AMAZING news to share! My book, Vessel, just won the 2013 Mythopoeic Fantasy Award for Children's Literature!!!!! Winners from prior years include Kristin Cashore, J.K. Rowling, Michael Chabon, Grace Lin, Franny Billingsley, Diana Wynne Jones, Jane Yolen, and Salman Rushdie. And now -- via what I can only imagine was some sort of clerical error -- me. This, my friends, is crazy-sauce!!! It goes without saying that I'm over-the-moon excited! I was thrilled just to be nominated for this award alongside such wonderful authors -- Merrie Haskell, Christopher Healy, Sherwood Smith, Jorge Aguirre and Rafael Rosado -- and am so grateful to the award committee for this honor. 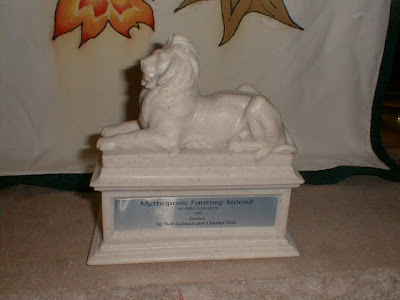 And to top it all off, the award itself is a gorgeous statuette of Aslan (the lion from C.S. Lewis's The Chronicles of Narnia). So. Ridiculously. Awesome. I've already picked out a place of honor for him on my writing desk. The Mythopoeic Society announced the winners of this year's awards (there's an adult literature award and two scholarship awards in addition to the children's literature award) during an awards banquet on Sunday at Mythcon, held this year at Michigan State University. When I was little, I never thought there were monsters in my closet. The monsters were all under the bed, along with the venomous snakes. The closet was for Narnia. I used to check it every single night, pushing aside all the clothes, digging through the shoes and stuffed animals, looking for a way to the woods with the lone lamppost. Winning this award makes me feel like I found the way into Narnia. I am so honored and so delighted, and I know my ten-year-old self would be too. I’ve wanted to be a writer since I was that ten-year-old girl. I believed—and still believe—that being a writer is the closest you can get in this world to being a wizard. You’re trying to cast a spell that lets you touch the minds and hearts of people you’ll never meet. You’re trying to transport people out of their lives and take them on a journey and then bring them safely back, maybe a little changed. I love the journeys that you find in fantasy books. I love the way that fantasy is (or can be) a literature of hope and empowerment. When I close a fantasy book, I feel as though the world is a little more magical, a little more wonderful, and a little larger than it was before. I write fantasy because, quite simply, it is what I love to read. After I received the news that VESSEL had been nominated for this award, I looked at the full list of nominees and winners of the Mythopoeic Award since its inception. It’s a list of every author that I’ve ever loved. I started crying when I realized my name would be on that list of wizards. So I want to say thank you from the bottom of my heart to the Mythopoeic Society, to my fabulous agent Andrea Somberg who has believed in me from the beginning, to my wonderful editor Karen Wojtyla at McElderry and all the other fantastic people at Simon & Schuster who helped bring VESSEL into the world. And especially thanks to my family, my children who are my world, and my amazing husband Adam who made my dream his dream and who shares every step of every journey with me. I wish I could go back in time and tell my ten-year-old self, "Keep looking in that closet for Narnia because, someday, you’ll find your Aslan. Or, more accurately, in the case of this beautiful award… he’ll find you." 57 days until Conjured comes out!!! In honor of that completely random number of days -- and also because I am ridiculously excited about this book -- I've posted the first chapter on my website. Hope you enjoy this sneak peek at Conjured! "Your name is Eve. Remember that." She was supposed to call him Malcolm. Pressing her forehead against the cool glass of the car window, she stared at the house. Yellow and narrow, it loomed over the lawn. She traced the outline of the house on the window: a peaked roof, two windows with shades drawn, a front door dead center. "It's a face," she said. The man and woman in the front seats checked their phones and then their guns. "You can't give her kiwis," the woman said to the man. Malcolm. And she was Aunt Nicki. "She'll think they're mice." "Kiwis are nutritious," Malcolm said. Twisting in his seat, he leveled a finger at Eve. "I walk first, you second, Nicki last. Understood?" He didn't wait for her response, and she didn't give him one. He stepped out of the car and stretched. "Start her on apples," Aunt Nicki said, opening her door and stepping out into the street. "Or bananas. Oranges." "You could have shopped," Malcolm said. "Besides, it is impossible to eat an orange without it spitting at you. It's a hostile fruit." "Oranges are classic. For centuries, soccer moms have been carting orange wedges to refuel their charming tykes on the field of battle." Outside, they shut their doors. Eve let the blissful silence wrap around her for three seconds until Malcolm yanked open her car door. "You push the red button to release the strap." His voice was kind and soft, as if he expected her to cower or bolt. He pointed next to her, and she located the red button. It clicked, and the seat belt snapped out of her hands and flattened onto the seat behind her. "It's going to be okay," he said, and she was certain he wasn't talking about the seat belt. Not wanting to see pity in his eyes, she stared at the seat belt contraption for a second before she climbed out of the car and followed Malcolm toward the house.